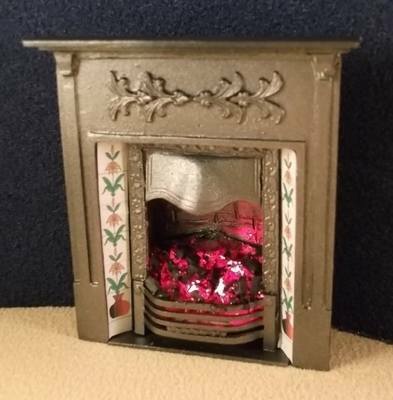 12th scale fireplace, made from metal. Please note- this item has a silver/grey finish, the lighting on the photograph makes it appear more golden coloured than it is. The fireplace is 86mm wide, 92mm height and 32mm in depth; fitting a recess of 45mm width, 70mm height, 23mm depth - such as a chimney breast. Lit with LEDs, no bulbs to replace.